Bolsa Chica (Orange County) High School’s Alan Dolensky earned All-League honors as a sophomore, junior, and senior. In his senior year, he was All-CIF, averaging 20 points and 14 rebounds a game. 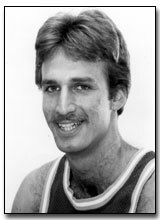 At the University of New Mexico, Dolensky was named Western Athletic Conference Player of the Week in his freshman year (for scoring the winning basket to upset #20 Wyoming). As a Lobo junior, he was voted New Mexico’s Best Defensive Player. In his senior year, he earned Most Valuable Player honors for leading the Lobos to a 24-10 record. An outstanding scholar as well as a top athlete, Dolensky is one of the university’s all-time scorers and rebounders, and holds the record for most minutes played in a season. Alan is a three-time Maccabiah Games basketball medalist--winning gold medals in 1981 and 1985, and a silver in 1989. He was USA Maccabiah Basketball Captain in 1985.